For many business owners, roof coating in West Mifflin, PA has been the answer to their roofing problems. Roof coating saves you money, eliminates the most common roofing issues, and extends the life of your roof by years. Roof coating is an innovative and cutting-edge technique that can make your roof strong and durable. Capital Coating is a leading provider of a variety of premium roof coating options in the area. 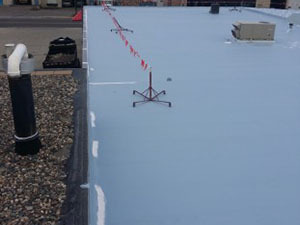 Call us today at (717) 442-0979 to learn more about roof coating for your commercial building. 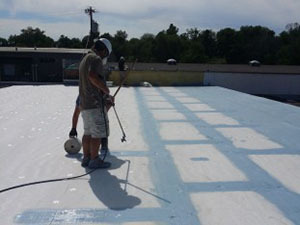 Roof coating is a revolutionary product that is either sprayed or rolled onto your roof creating a leak-proof membrane that adheres to your roof. It is a budget-friendly, energy-saving option that makes your roof stronger and more durable for years. Capital Coating uses premium roof coating brands like Conklin, Astec Roofing Solutions, and American Weatherstar that are reliable and dependable. Conklin has been a trusted name in the industry for over 40 years. One advantage of using these premium brands is the fact that they provide a seamless, waterproof barrier for your entire roof. This cannot be said about other roofing systems. The unique science behind such roof coatings is that they are fluid-applied. This enables them to adhere to any surface and, once dried, they become a superior, moisture-blocking protection for your roof. Capital Coating has over 20 years’ experience in the roofing industry. Our skilled, professionally trained technicians that stay up-to-date on roofing application processes. Our motto is “Doing It Right Matters” and we believe in nothing less than the best in all of our roofing procedures. When you hire Capital Coating for your roof coating in West Mifflin, PA, you can expect excellence, quality, and attention to detail. If you think that roof coating just might be the commercial or industrial roofing solution that you have been looking for, give us a call today at (717) 442-0979 to discuss your roofing needs.